Studies have shown that taller men get the job...get more salary...get the girl...get more respect...get raises and promotions faster. Our shoes may help improve your posture (you'll stand straighter)...add confidence...may even make you look thinner! WILL ANYONE KNOW I'M WEARING ELEVATORS®? While our shoes have to be a little bit taller in the back, your pant leg hangs down over the back, usually covering up the added back-height of the shoe. For the most part, our shoes look just like any other non height-increasing shoe. CAN I PUT YOUR INSERTS IN "REGULAR" SHOES? "Regular" shoes are not designed and engineered to hold our innermold. Your feet will come out of the top of the shoes and will be very uncomfortable. IS YOUR SIZING DIFFERENT BECAUSE OF YOUR INSERT? No. Order the same size as you would in any other shoes. Generally, the answer is no. Most men wear their pants with a "break" in them on top of their shoes. 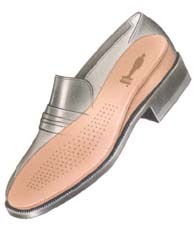 The extra length of the pants will accomodate the extra height of the shoe so no alteration is normally necessary. HOW IS THE PACKAGE SHIPPED TO ME? We know that cofidentiality is important to our customers...that is why we ship all of our products in plain brown boxes with no reference to ELEVATORS® anywhere on the package. We do not sell or rent our mailing list to anyone...EVER. WHAT DO THE LETTER WIDTHS MEAN? B-Narrowest C-Narrow D-Medium/Normal E-Wide EE-Wider EEE-Widest...60% to 70% of our customers wear a "D" (medium) width. All in-stock orders are shipped from our facility within 2 business days of receipt of your order. Actual delivery time to you by UPS or the postal service will vary depending on your geographical location. Delivery usually takes from 1-5 days as it moves from the east coast to the west coast by UPS ground service. If your shoes are not satisfactory to you, you may return them to us as long as they are unworn and returned within 30 days of ship date to you. You must pay the postage to return the item(s) to us and we will send any exchange to you at our expense. Returns for credit/refund will be processed promptly. For international orders, the customer must pay postage charges both ways. I HAVE ONE LEG SHORTER THAN THE OTHER...CAN YOU HELP ME? We have many customers with this situation. We have some alternatives/options that may work for you. It is recommended that you call us for the best option for you. Call 1-800-343-3810. WHERE CAN I GO TO TRY YOUR ELEVATORS® ON? ELEVATORS® are sold through our website and our catalog. They are not sold in stores. We do have a warehouse showroom at our facility in Frederick, Maryland. We are open Monday-Friday from 9:00AM-3:30PM EST. Call ahead for directions. ELEVATORS® take a little time to get used to. You will initially get a feeling like you are walking downhill. That will wear off in a short time and they will eventually feel like you are wearing "regular" shoes. When you get your first pair of ELEVATORS®, walk on a carpet for an hour or so for 2 to 3 days to help you get used to the "new" feeling. FOR ANY OTHER QUESTIONS, E-MAIL US OR CALL US AT 1-800-343-3810.